Last night I had a long visit with my sister via telephone, and she told me about a tea she has been making for her husband to soothe his cold/cough symptoms. She makes an infusion of freshly grated ginger root and lemon, and then lets it steep for about 5 or 6 minutes... strains it and then adds a bit of honey before he drinks it. She says it has been helping tremendously. All righty, I am in for that. So, today I headed off to my monthly Weight Watchers weigh in and then ate my last LARABAR for breakfast. Peanut Butter and Jelly. I savored every little nibble and you can bet I didn't share it with The Captain either.... well, I offered him some, but I had already cooked him a breakfast of hash browned potatoes, eggs, toast and jam so I knew there was no way he was hungry! He declined like the good husband he is. This LARABAR is my very very favorite. It smells like peanuts. And it tastes like peanut butter, with just a bit of sweetness added to it. Mmmmm. Calories 210; Protein 6g; Carbohydrate 27g; Fat 10g; Fibre 4g. And it kept me satisfied till well past my normal lunchtime. I was really pleasantly surprised! If you want to try one for yourself, you have the rest of the evening to enter my giveaway HERE. Tomorrow I will announce the winner and make contact by email. Good Luck. When we got back from running our morning errands, I made up a big pot of that tea, and it was not only tasty, I really think it is helping. I am about to make another this evening. Do you have any home-remedies for colds and sniffles? When my kids get the dry cough, put vicks on their feet with socks on. Load it on. It works amazingly! It's so weird! 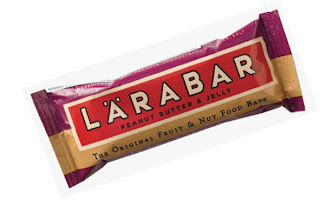 2) That PB&J Larabar sounds so DELICIOUS! I''m soooo jealous! 3) I can't wait for tomorrow!! I'm so excited to see who the winner is!! I love the Larabar PB&J! No home remedies for colds but a ton of rest has helped me this week. Feeling better after just a few days of feeling bad. I forgot to mention...I signed up for HBBS 2012 too! It's going to be fun. i really love tea! its sooooo good. especially now that it is getting colder. so comforting. hope it is helping you to feel better quickly! the pb&j bar is one of my absolute faves! I feed my kids honey when they have a cough and rub vicks on them. Seems to really help. I better go make sure I did all the entries to your giveaway!